Out of all the recipes we tried during our canning day extravaganza, our favorite was definitely the Spicy Tomato Salsa, taken from the Ball Blue Book. 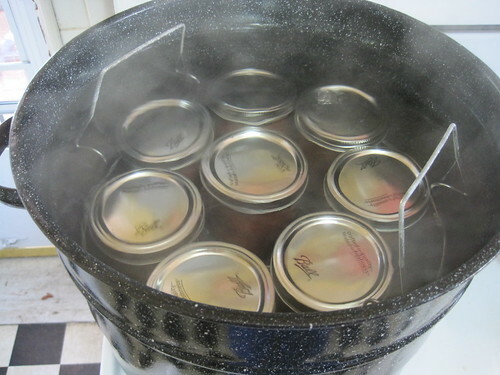 I'd recommend the book to anyone getting started with canning. Lots of great recipes, tips, and technique info - including a Problem Solver section for those "wth happened to it???" moments. 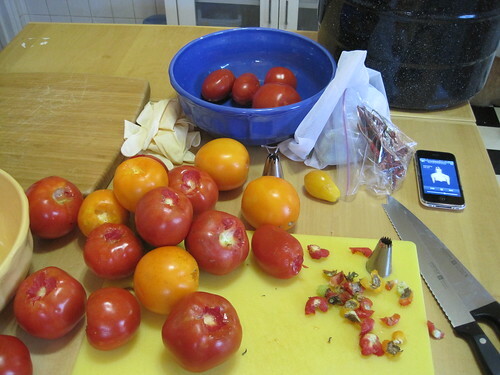 We've already gone through about 2 quarts of the salsa we made last time, so while the tomatoes are fresh, I decided to do another batch over the weekend. 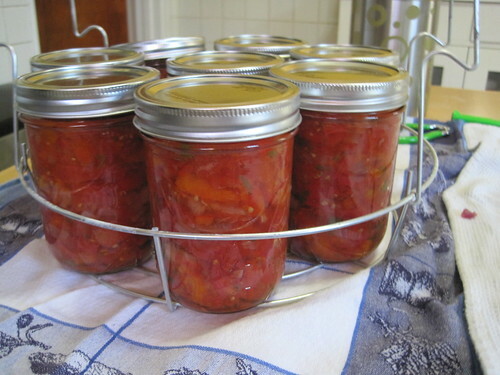 I admit to having a bit of 'canning anxiety' in the sense that I want to get tons of tomatoes preserved while they're still in full swing seasonally. Fortunately, the garden is now, in September, finally loaded with green tomatoes just waiting to ripen. This may be the first of many tomato preserving days! 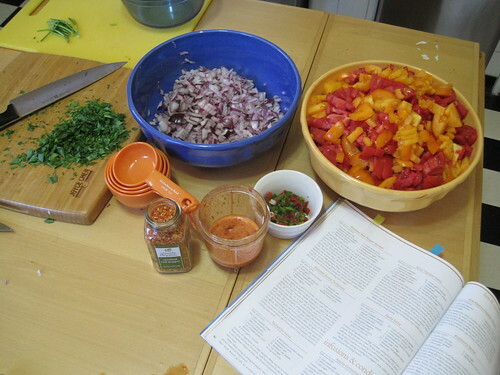 The salsa is easy enough to make, but the prep takes some time. 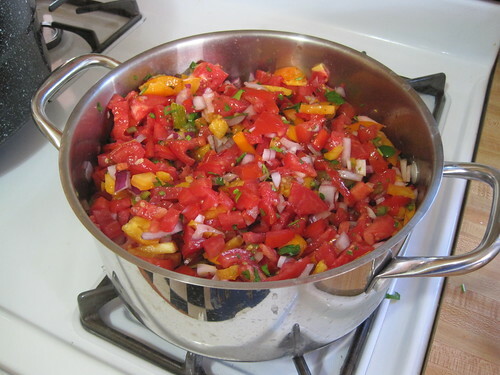 I don't mind having the seeds & tomato skin in the salsa (especially since we usually purée it before consuming anyway) so I skip this step, which saves some time. 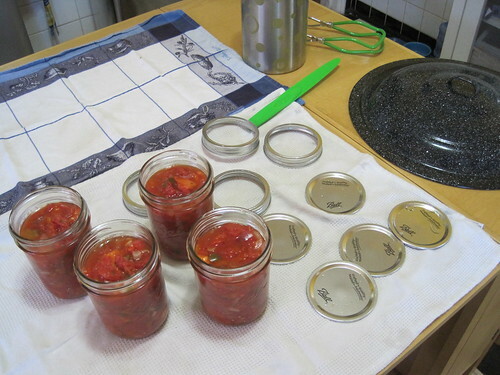 I've also been using a nifty trick I learned in the canning class - if you have any metal pastry tips on hand, they are great tools for coring tomatoes (and onions, strawberries, etc.). Just poke the tip into the top of the tomato and give it a little twist. The top will usually pop right out. Peel, seed and dice tomatoes into 1/4-inch size pieces. Place chilies in a small bowl. Pour boiling water over chilies just to cover. Secure plastic wrap over bowl and allow peppers to steep for 15 minutes. Drain half the water from chilies. Purée chilies and remaining water in blender for 1 minute or until smooth. I also substitute parsley in place of cilantro, since so many people I know seem to find cilantro downright offensive. I actually like it, but I've found parsley works just as well. Once prepped, combine all ingredients into a large saucepan, bring to a boil, then let it simmer for about 10 minutes or until mixture has thickened, then it's ready to be put in jars! 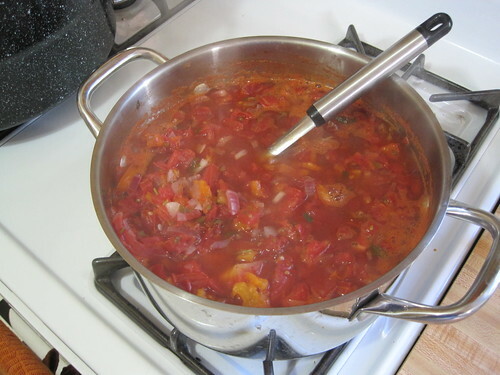 Carefully ladle hot salsa into hot jars, leaving 1/4-inch headspace. Remove air bubbles with a nonmetallic spatula. Wipe rim and threads of jar with a clean damp cloth. Adjust the two-piece caps. Screw band down evenly and firmly just until resistance is met – fingertip tight. Yum. :) This batch should be a bit spicier than the first one we tried since it has a little bit of extra jalapeno. Looking forward to my diet cheat day (more on that later) so I can try it out without worrying about how many tortilla chips I've had! mother nature does not care about our timelines. suddenly I realize, that if I stepped out of my body, I would break into blossom.